‘Finisterre’ looks a funny, archaic word. In fact it comes from the old world misconception that the far western tip of Spain was finis terre: the end of the Earth. Cape Finisterre, NW Spain, has been in the news more recently due to its name change in order to avoid confusion in the shipping forecasts. Until 2002, both Britain and Spain used ‘Finisterre’ but for different waters. So in Spain, Finisterre became FitzRoy. This quirky anecdote may ring a bell, Finisterre’s currently referenced on billboards across the UK in what has been one of the most expensive advertising campaigns ever, announcing Norwich Union’s name change to Aviva. Finisterre is also the title of a film currently showing at Nottingham Castle courtesy of Film and Video Umbrella (www.fvu.co.uk) who continue to work with artists and venues to produce sterling work despite the stormy seas of recession. Gemma Pardo, the artist who made this particular film, is Spanish born and so, one imagines, the laden term ‘Finisterre’ has solid resonance with her. 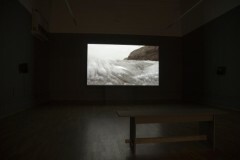 At Nottingham Castle Pardo’s Finisterre is projected onto a large screen that is found in a side room adjacent to a show of Turner paintings and Turner-inspired drawings. In effect you watch Pardo’s film with your back to Turner and his legacy, not out of disrespect but in order to give the film its due attention. Indeed time is requested – the film is about 20 minutes long. As I watched the film a steady stream of visitors passed on by until a toddler of about 4 years old nudged me up the viewing bench. Before long he commented aloud to his pram pushing father – a silhouette stood some way back from the screen’s light: ‘But daddy, it’s just a film of the sea.’ On one level Finisterre is just that but, along with the childlike view I also have a teenage enthusiasm for the visual arts tempered by a cynicism that is middle aged before its time. So my summary is that this film ‘of the sea’ actually has an abject, rugged beauty that, arguably, only art ever achieves. This is what's called a meditative film – in it, the only action is that dictated by nature as sea kisses land at some craggy coastline. The only sound is the swirl and splash of water. The only memorable moment is when a vague but still wondrous sunlight, muted by heavy cloud cover, just starts to break through and hit that always beguiling horizon. Pardo’s shot selection is engaging for its starkness. There are only two shots: the close-up of coastline; and a look out to sea. In both, the camera is set down at sea level. It is an unusual viewpoint. The coastline shot seems to have been filmed at a pivotal time of day as the tide comes in and water splashes the camera leaving globules on the lens face. 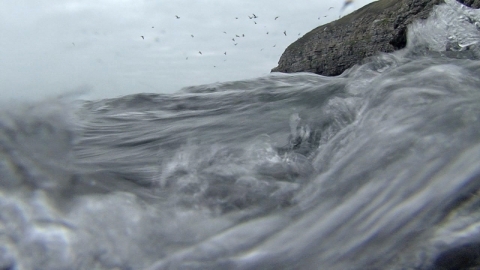 The random play of nature builds and water ultimately immerses the camera, revealing a murky marine life. There is no beginning, middle or end to this film but it’s worth watching from start to finish. It’s subtle. And like good art of this contemplative kind, it has the potential to prompt in your mind visions of poesy. It is the polar opposite to the ‘faster’ formats of TV advertising or music video that depend on ever more flash-cuts and edits per minute. The only rhythm in Finisterre is the soporific beat as water laps against land. If you watch with an open mind then Finisterre’s apparent nothingness conjures something up. Yes, the film only shows ocean, earth, the tidal cycle, the horizon… ‘Just a film about the sea’. Yet the aforementioned list, arguably, contains everything: water expresses life; earth stands for evolution; the tidal cycle conjures up time itself and the incomprehensible machinations of our vast universe of delicately balanced planets… and the horizon, well the horizon is a synonym for ‘that place, that space’ that artists can take us to in so many ways – overtly, simply, naturally in Pardo’s film. Of course, the film also leads back to Turner. In particular there’s a point in the film when a powerful sun, stymied by thick cloud, starts to break through. Many viewers will see those few seconds, more than the film as a whole, as a ‘21st Century Turner’. Of course, it doesn’t matter whether Turner would use film if he were alive today or if he would still be as enamoured with picturing sea spray and mist and light. It doesn’t matter because this is Pardo’s film and the resonance with Turner, naturally felt given the context of concurrent shows, is really neither here nor there. After Nottingham, Finisterre will dock in two further venues: 28 Feb – 3 May at Ferens Art Gallery, Hull; 17 May – 30 Aug at Hastings Art Gallery. Journalist, writer & critic: previously worked for The Guardian Media Group Plc as visual arts editor/general feature writer (1996-2007); freelanced for newspapers, magazines, websites and broadcasters.